Realtime Racing used the bump in August 2017 for a testing session. They had no issues, and set some damn fast times. CJ Wilson Racing got the bump in February 2017, in their first laps at COTA, when CJ made the jump to the Porsche 911 GT3 Cup class. Obviously quick. January 2017, at Kart 2 Kart, when Jalopnik wanted to see just how much slower the writers were than our readers. A reader stomped with this bump. I think you get where I’m going with this. Global Motorsports Group started making fast cars faster in 2001. They design, build, supply, install, and service Porsches, Audis, Lamborghinis, and other quick machines, and have a long track record of making their customers happy. When they aren’t making canyon carvers and track day rides even better, they run a solid racing team, complete with a handful of 911s and Caymans. 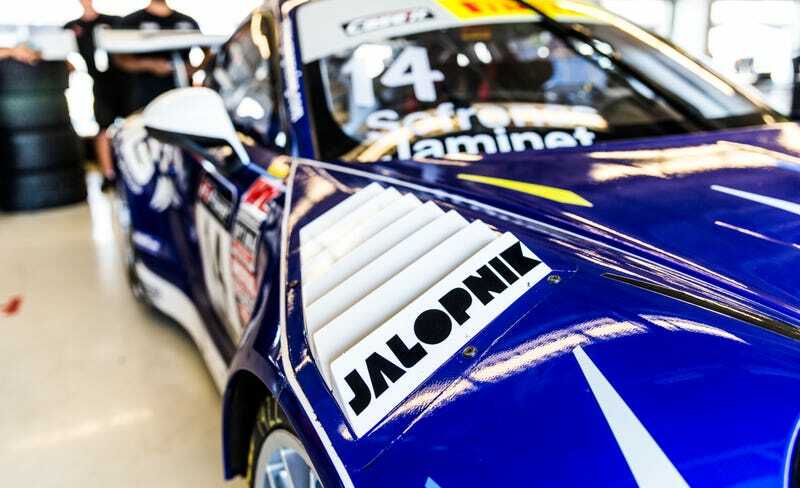 GMG Racing (not to be confused with Gizmodo Media Group) has been a staple in the Pirelli World Challenge since Speedvision was still around, and they’re big fans of Jalopnik. GMG first took a gamble at Circuit of The Americas in March 2016 when James Sofronas, owner and lead driver and Joe Foster, GMG team manager, agreed to let me give his trusty Porsche 911 GT3R the Jalopnik Bump. PWC teams typically run multiple races over a weekend, and we discussed putting our sticker on the 911 before that race, but didn’t pull it off in time for the grid. Sadly his bright blue beast got caught up in an opening lap tangle with a pack of drivers eager to dive into COTA’s signature 133-foot climb into turn 1, which led to an early pit stop to replace the front bumper. Think that was the gods looking down on him that afternoon? That fateful day in Texas, March 2016. With the bumper trashed, it needed a freshly wrapped replacement, and James joked that if the bump would work its magic this weekend we should slap that sucker on the front of his injured Porsche. I was happy to oblige. For Sunday’s race, Sofronas qualified 17th, and looked to move up through the field with his newfound bump. Think this is good enough placement? With a hint of driving skill, and a whole lot of orange-sticker witchcraft, that #14 911 GT3R flew through the pack, and solidified a 9th place finish. Not too shabby. Sofronas and Joe Foster, team manager, agreed that the bump was real, and that this should become a common practice for GMG Racing. Who would doubt such wisdom? As GMG was set to return to COTA in September 2017, we knew the bump had to happen again. You’ve got to have an ace up your sleeve. Knowing that the bump had worked so well last time, and that others have used it successfully, we made it happen again. The Pirelli World Challenge Sprint-X class had to do a makeup race, from a rained out day at Canadian Tire Motorsports Park earlier in the season, and Sofronas and co-driver Mathieu Jaminet won their class on Friday night. Fender vents are cool. This makes them even cooler. Saturday afternoon Jaminet and Sofronas felt the power again, and won their class once more. Sunday came along, and what do you know? With Jaminet starting from the front of the field, and after having one exciting battle over the closing laps with Tim Pappas in his AMG GT, Sofronas held on to not only sweep the Sprint-X Pro/Am class races for the weekend, but also clinch the 2017 championship. At the end of the weekend, the #14 car wasn’t the only GMG machine to experience success. George Kurtz took two wins in his McLaren 570 GT4, Carter Yeung captured a pair of third place finishes at the wheel of his Cayman GT4 Clubsport MR, and the team headed back to Santa Ana, California with a truckload of hardware. How much more obvious can we make this? The Jalopnik Bump is real, and every racing team should be reaching out to me to apply these decals to their trusted race cars if they want to win more often. Just ask these guys. 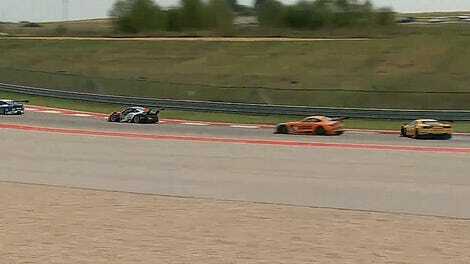 Here are a few more shots of the GMG Racing guys doing their thing over the weekend at COTA.